Controversial teen duo Tatu have topped the charts for a second week as a revamped Radio 1 chart run down was unveiled. 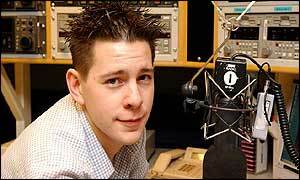 DJ Wes Butters joins the BBC station to announce the weekly top 40 of best-selling singles and albums. The 23-year-old takes over the reigns from Mark Goodier who stepped down after nearly a decade. Butters first week saw Russian girl band Tatu remain on top with their hit All the Things She Said. The girls, Julia Volkova, 17, and Lena Katina, 18, have been gaining attention because they have been marketed as "lipstick lesbians", wearing school uniforms and kissing in their video. But they have been accused of promoting "paedophilic pop" in order to secure a chart hit. Tatu prevented 'NSync star Justin Timberlake from achieving his second solo UK number one single with Cry Me a River. Timberlake, who used to date fellow pop star Britney Spears, entered the chart in second position. Oasis' latest release from their Heathen Chemistry album, Song Bird, entered at number four. Destiny's Child singer Kelly Rowland's solo effort Stole has slipped two places to number four. But her album Simply Deep has topped the UK album chart in its first week of release, forcing Timberlake's Justified down to number two. US rapper Sean Paul rounded out the top five singles charts with Gimme the Light. The only other new entry in the top 10 was from the south London garage collective Big Brovaz with OK.
Eighties soul diva Lisa Stansfield is enjoying comeback with her greatest hits album reaching number three. Entitled Biography, it features the singles Been Around the World, Someday and All Woman. The late R'n'B singer Aaliyah, who was killed in a plane crash in 2001, has secured another chart smash as her album I Care 4 U enters at number 4. The album features some of her greatest hits and songs she was working on before her death.